My life originated in Northern Wisconsin. The city folk that would visit back in the 70’s led me to believe our style of living was lacking luxuries of modern times. I longed to leave and did so as soon as I had graduated high school– not yet 18 years of age. Ironically, my table has turned, or so it seems. To have a place of retreat in the north woods is a blessing– either hard work to earn another residence or the fortune to have an inherited family homestead to call your own. Yet a double residence is difficult to maintain so I appreciate this fact in my reflection. This morning I sat for my reading with a cup of coffee and a cool breeze. The waves are lapping against the shore and hitting my brother-in-laws sailboat like a deep, earthly drum. A hawk landed in a nearby barren treetop as the loons sang a morning song. I had just finished reading His Word but nature sang worship songs of praise so clearly. Across the water sits a raft. I am reminded of summer days at Uncle Rusty and Aunt Ruth’s cottage. 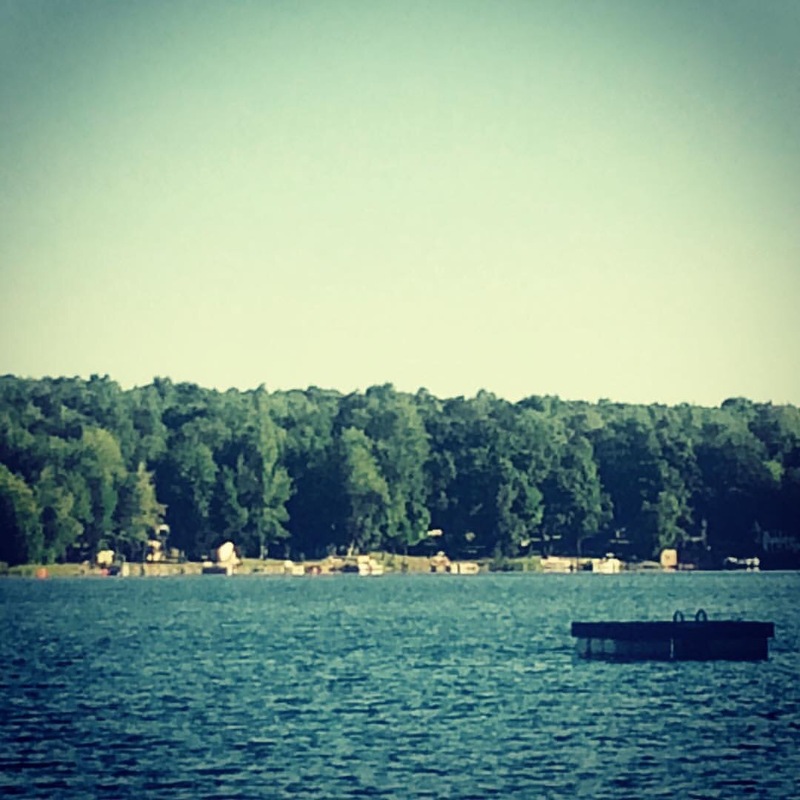 When our cousins came for a weekend visit, the lake took on a special life and the raft was the center of attraction for water fun. To have a place to swim on a lake was neat; having a raft was awesome. Rafts were simple, wooden boxes atop empty steel drums like the one pictured above. They weren’t the inflatable condominiums of our modern age. The more luxurious rafts were carpeted with AstroTurf. A raft with a ladder was a perk. Without a ladder you wedged your toes on the lip of the steel drum and catapulted yourself atop the raft to warm in the summer sun. I can feel the splinters of wood catching on my swimsuit as I recall these memories of days gone by. Life was good, I just didn’t know it. As we entered this National Forest last night, I opened the window a bit more to permeate the car with woodland air. The forest floor is a perfect purifier. Is it the pine needles that filter and scent the air so magically? I simply drank it in. The mental place I am in reminds me my course in life should not be altered. The path I have taken has shaped me as He needs me. As I travel to different corners of the earth, I can appreciate where I go without feeling the need to change it as many “flat-landers” did my hometown. I can travel to some of the most impoverished areas of the world and see they don’t need modern conveniences. They need HOPE… both clean water and Living Water. I read the manual for my next short-term mission trip on the way “up north” last night. I need awareness of the culture so I can blend without causing offense to the Nationals. I came to realize, life had prepared me for such a time as this. I hope I can be a light into the world rather than an stereotypical American missionary. I go with the peace of Christ in me; not a new fangled way of life. I’m grateful for this rare weekend in my homeland to remind me of life in the sticks before I climb the next mountain. It’s a family reunion that brought me home. The larger picture is the ultimate family reunion that lasts an eternity. Feast, we will! Without crockpots or sarcasm.